Blue Origin still expects to begin crewed flights of its New Shepard suborbital vehicle in 2019, but is in no hurry to start selling tickets or even set a ticket price. SEATTLE — Blue Origin expects to start flying people on its New Shepard suborbital vehicle early this year, but has yet to start selling tickets or even establish a ticket price for future commercial flights. In a panel discussion at the American Institute of Aeronautics and Astronautics SciTech Forum in San Diego Jan. 8, Ariane Cornell, head of astronaut strategy and sales at Blue Origin, said the company is eager to start flying people on New Shepard but that it places a greater emphasis on safety over schedule. The suborbital vehicle has performed a series of test flights, none of which have carried people. 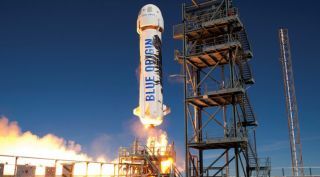 The company had planned to carry out another uncrewed test flight last month, but postponed it because of technical issues. Blue Origin hasn't announced a new date for the launch but Cornell said the next launch was "coming up relatively soon." The company has made it clear that it plans to use New Shepard to fly space tourists, including producing a video outlining what the flight experience will be like and showing off a model of the crew capsule whose interior is outfitted with six seats for flying people. The company, though, has yet to start selling tickets for those future flights or even disclose their price. "We're not selling tickets yet. We have not selected a price yet, despite what you might have read," she said, a reference to a report last summer that claimed the company was planning to charge between $200,000 and $300,000 per seat. "We don't have a price yet. We haven't determined when we're going to sell tickets." That strategy stands in stark contrast to Virgin Galactic, which has been selling tickets for flights on its SpaceShipTwo suborbital vehicle for more than a decade. While the company put sales on hold after a 2014 test flight accident that destroyed the first SpaceShipTwo and killed a pilot, company founder Richard Branson said after the second SpaceShipTwo’s most recent flight Dec. 13 that ticket sales would soon resume. Those tickets had been priced at $250,000 each, but Branson said the price would likely go up, at least temporarily. "What will happen in the short term is that the price will go up a bit," he said. "And then, in the next most likely three years, it will start coming down." He didn't specify the size of the increase or by how much the price would later decrease. Virgin Galactic is expecting to begin commercial flights later this year from New Mexico's Spaceport America, pending the completion of a test flight program that Branson said last month could be relatively short. He still planned to be on the first commercial flight of SpaceShipTwo. "Sometime next year, once the testing is finished, then I'll do my flight," he said in December. While Blue Origin hasn't started selling tickets or set a price for them, Cornell said during the panel, titled "Exploration for Everyone," that the flights wouldn't be restricted to just those wealthy enough to buy a ticket. "Space is a very expensive endeavor," she said. "That said, we are going to find ways to make sure that it's not just the ultra-wealthy that are going to be able to fly to space." Cornell said she's looking forward to flying herself. "Believe me, if I could, I would jump on top of that rocket tomorrow," she said of New Shepard. "We're getting there. I'm just as anxious as you all are, but we have to do it right."